Tenby Apartment 2-bedroom apartment. Thisfantastic apartment feature a fully equipped modern kitchen, a stylish lounge and 2 cosy bedrooms each with ensuite tiled bathrooms. Tenby apartment has been finished to a very high standard with polished concrete floors in the living areas, wonderful art and tasteful decor. 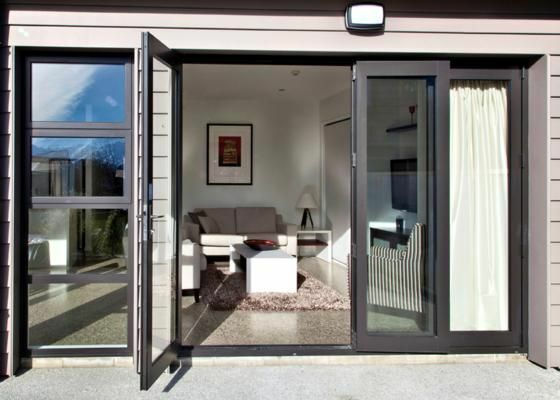 The Apartment boasts huge windows and double bi-fold doors ensuring a great indoor outdoor flow. Tenby 2 features a huge private deck with BBQ, in a lovely garden setting, to help you relax at the end of the long summer days. The Tenby Apartment features undercover garaging, full laundry facilities and dedicated ski drying rooms for your convenience. Great location and lovely apartment. Great location and lovely apartment. Very modern, tidy and clean. It would have been nice to have some free WiFi. Didn’t have view, but lovely property. Very clean, convenient location and kitchen well furnished with amenities. Very clean, convenient location and kitchen well furnished with amenities. Would recommend. Beautiful apartment with plenty of space and luxury as well as being well equipped to cook and spend time in the kitchen too. Really central location to the waterfront and town centre, we will definitely be staying again! Highly recommend!